The perfect gift for that chocoholic! 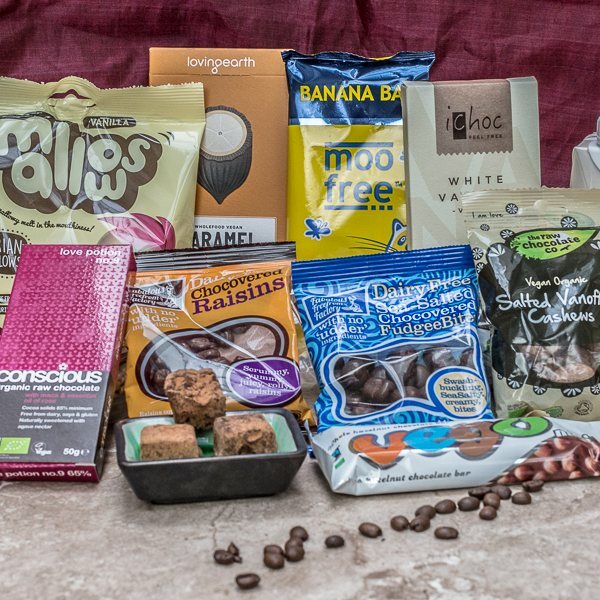 All of the choccies within this box are dairy free and suitable for vegans. With items ranging from chocolate covered, raw chocolate, dark chocolate, mylk chocolate. Basically this box is packed full of all things chocolate! 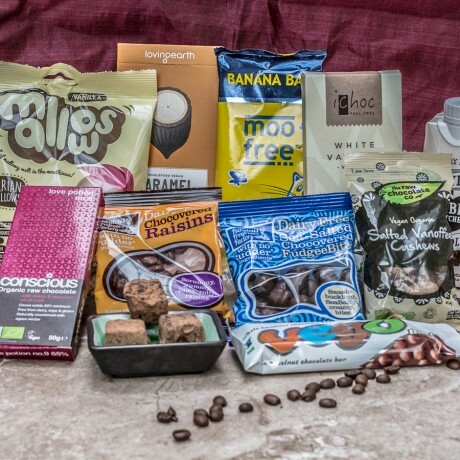 This chocolate varity box contains the following 10 items! The shelf life of these products will generally be in excess of at least 3 months. This chocohilcs box will be packed into a box and delivered via courier. A gift note can be added to the poduct. 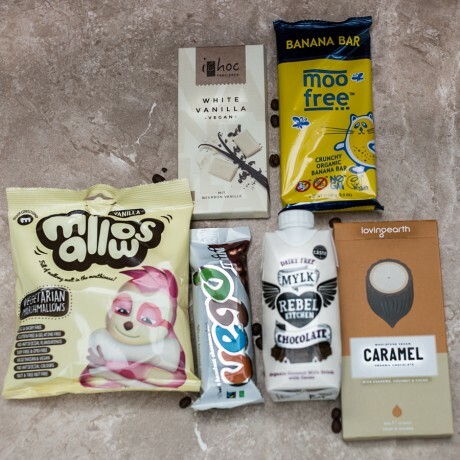 Rebel kitchen choclate mylk 330ml - Ingredients:Water, coconut milk, date nectar, cacao. Fabulous free from fudgee bites 65g - Ingredients:Fudge(sugar,glucose syrup, soya milk,fondant(sugar,glucose syrup), cocoa butter,sea salt,natural flavouring,colour:plain caramel)dairy free chocolate(sugar,cocoa butter,soya flour,cocoa liquor,emulsifier:sunflower lecithin) glazing agents:gum arabic,zein. chocolate coating(50%) fudge(50%) dairy free chocolate coating contains 30% minimum cocoa solids. Ichoc vivani white vanilla - Raw cane sugar *, cocoa butter *, rice milk powder * 18% * erdmandelgrie--, bourbon vanilla beans * (ground). 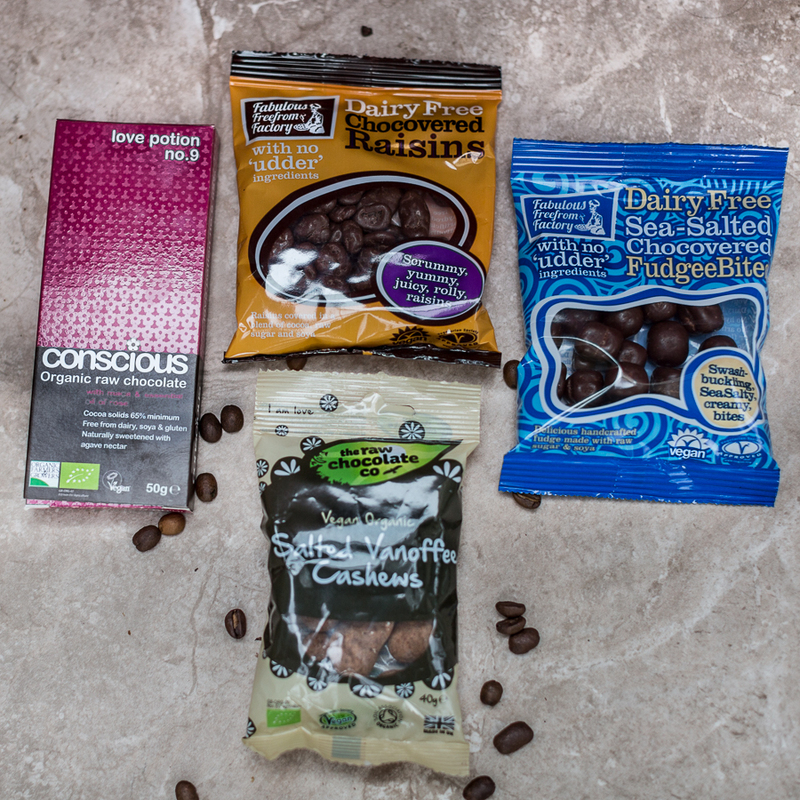 Chocolate covered raisins - Raisins (50%), raw sugar (17.50%), cocoa butter, soya flour (11%), cocoa mass, emulsifier: sunflower lecithin. Freedom confectionary company marshmallows - Glucose-fructose syrup, sugar, water, dextrose, carrageenan, maize starch, hydrolized soy protein, flavouring: natural vanilla flavour with other natural flavours, colour: titanium dioxide. Conscious love potion no9 - Raw cacao powder (Equadorian), raw cacao butter (Equadorian), and agave nectar (17%), coconut butter, carob powder, maca (0.04%), essential oil of rose (0.05%), cinnamon and Himalayan salt. Cacao solids 65% minimum. This product is dispatched by Conscience Foods. This item has a shipping weight of 2g.